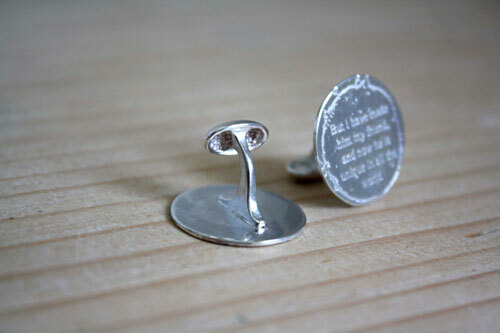 These cufflinks are made of sterling silver made by hand in my workshop. The main theme is the one of the Little Prince from Saint Exupery. 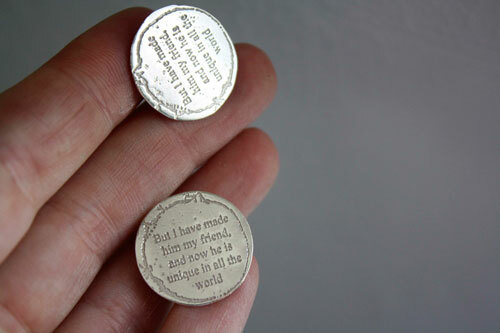 The engraved sentence is from the book of the little prince and which says in English: But I have made him my friend, and now he is unique in the entire world. It is artisan etched. The etching process takes times but the result allows appreciating the intricate and delicate patterns. The bas-relief effect is really nice. The deeper part is matte and the upper part has been sanded and polished. Etching is an artisanal process, which produces a unique design each time I use it. Two pieces with a same design will never be the same because the acid reacts differently according to the surfaces. Each detail makes a unique piece. The diameter of these cufflinks is 2 cm. Thiswill be the ideal gift for Le petit prince lovers. 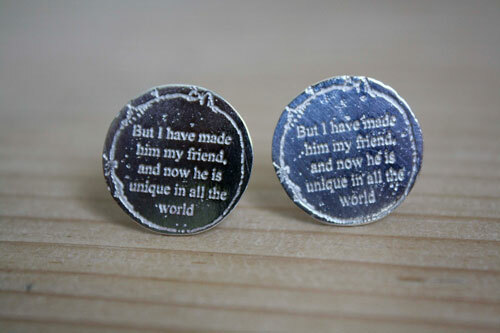 I will need 4 days to make these cufflinks. 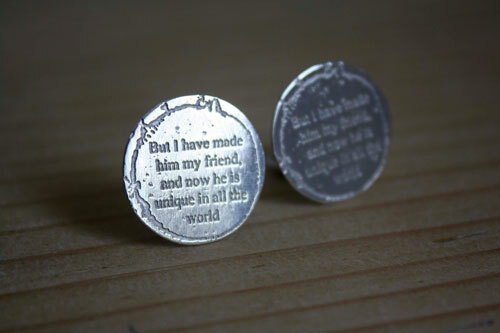 Tag: sterling silver, cufflinks, medal, quote, wisdom, the little prince, planet, children story, handcraft, feminine, delicate, unique gift, modern, ethnic, ecology, sky, elegant, discrete, philosophy, love.